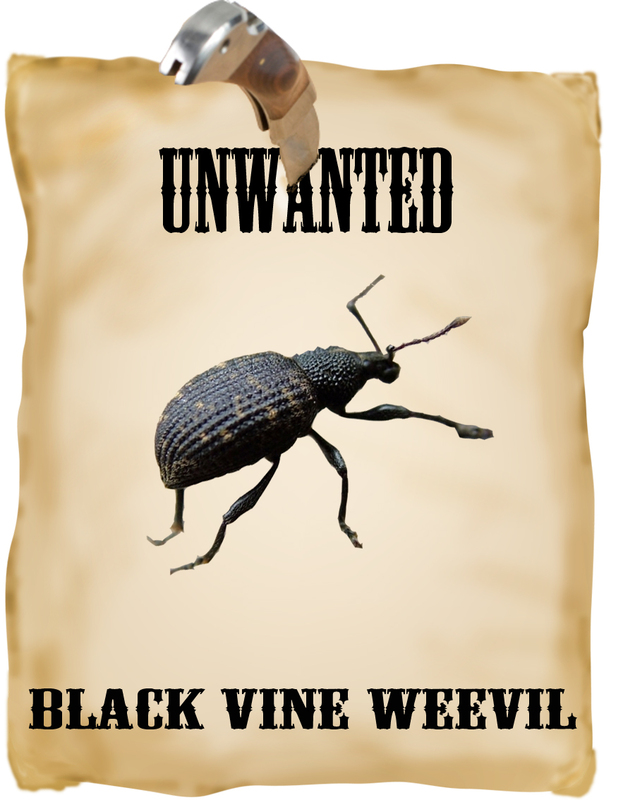 Number 6 in our countdown of America’s Most Unwanted garden pests is the Black Vine Weevil. The Black Vine Weevil (Otiorhynchus sulcatus ) is a root feeder. Although adults will damage foliage, the most serious damage is done by larvae feeding on roots. The insects’ diet includes hundreds of shrubs and ornamentals, including yew, hemlock, some rhododendrons and other broad-leaf evergreens like azalea, mountain laurel and euonymus. Adults can also feed on deciduous and herbaceous plants. When shrubs fail to put out new foliage in the spring or new foliage quickly yellows or dies, one of the first suspects is this evil weevil. Another indication is the characteristic crescent notches on the leaf margins made by adults feeding. The adults are active at night throughout the summer. The non-flying insects are about ½” long, slate grey to blackish-brown with pitted wings and a short snout. One important step to prevention is carefully examining new plants before bringing them home. Since adult insects are unlikely to be seen, the leaves should be checked for signs of damage. If you begin to see leaf damage on your shrubs – or stunted growth – call your Almstead arborist for an inspection. Often, by the time the damage is noticed, the plant’s health has been seriously compromised. If you didn't treat for Black Vine Weevil this year and are wishing that you had, consider a fall treatment to reach overwintering larvae, which are found in the soil.